When someone dies, we tend to write stories about him or her. We read these stories aloud during funerals and sometimes share booklets with stories about the souls gone for this life. The process of preparing a booklet can be a painful one, though. Getting your head around design when you are grieving from the inside is absolutely troubling. Therefore, you should consider using funeral booklet templates instead. 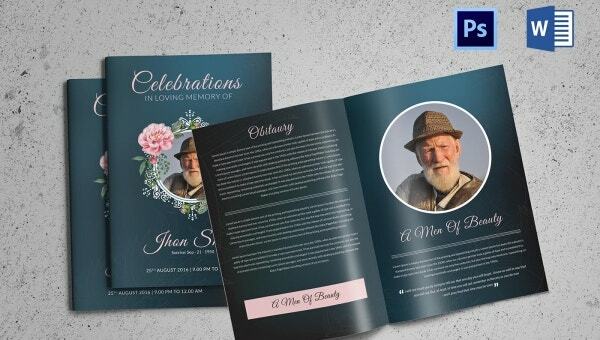 The Funeral Templates are pre-designed, editable booklets created to help you write the stories of the people you once loved. > Who should use the Funeral Booklet Template? A family member who’s well conversant with the deceased can use the template to write a brief note about the dead person. Each booklet template suggested in this article has more than enough pages to help you, the family member of the departed soul, to write the story about the demise of your family member. The pages on the booklets ranges from six to eight pages, while others have sixteen pages. 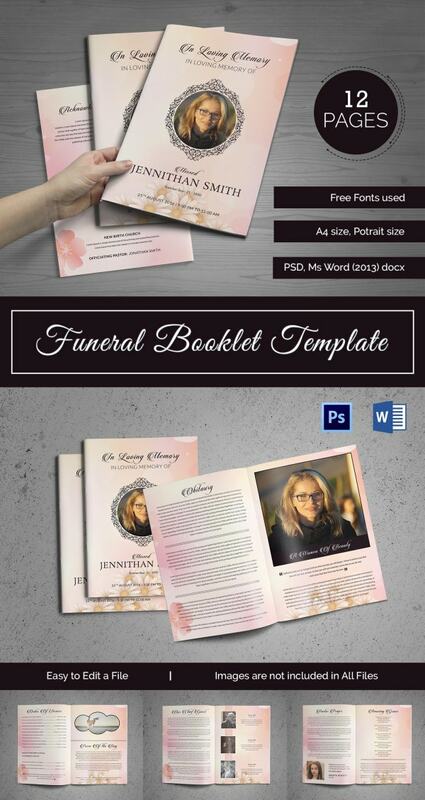 You can also see Funeral Stationary Templates. Friends to the dead can also use the funeral booklet template. The stories they write are important, for they help to shed light on who the dead actually was when they were still alive. The Booklet template will help you to write the story of the deceased without worrying about the design of the theme. Because the template features 100% editable layers, all you will ever have to do is to replace the sample text with yours. Of course, there is no specific way to structure your words. Feel free to use the template to write your story the way you want it. Because the best booklet templates are already available online for download, you could download the premium templates instead of creating a model from scratch. Besides being high quality in the terms of design and layout, they are also cheap. Even if creative design is your forte, getting a funeral booklet done in time can be quite difficult. Because the death of someone special often brings with it a mix of emotions, tears and fear, it would be best if you used a pre-made template instead of creating the model from scratch.